Several years ago, I attended the Upper CLASS professional speakers’ and writers’ training in Connecticut. The founder of CLASS, Florence Littauer, and her team critiqued each woman as she gave her presentation in front of our small group, praising her for what was good and giving her tips for how to improve it. The weekend was encouraging, motivating, and inspiring. We were treated to delicious, elegant, home-cooked meals prepared by our hostess and her husband, were helped with a mission statement and a logo for our websites by Florence’s daughter, Marita, and were given a private consult with the great, legendary speaker/author Florence Littaeur. It was one of the most powerful ministry/business times I’ve ever had in my life. Before we left to go home, Florence surprised and blessed each of us with a Curious George stuffed animal (pictured above), which I keep on my office desk and cherish. Florence told us to always be curious, always learn new things each day. 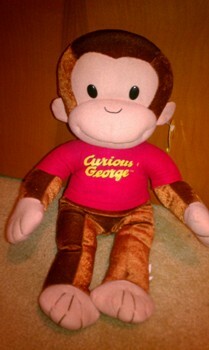 Are you a Curious George? Are you learning? Did you learn something new today? It’s important to learn new things each day – and then do things with what we’ve learned. Be teachable. Glean from others’ experience and those who are ahead where you want to be. Hire a business, finance, health/fitness, writing, or speaking coach or mentor – people who can pour into your life and help you personally grow. Ask questions of your grandparents, family members, elderly neighbors, other senior citizens. They have a lifetime of wisdom to share with you and can tell you their mistakes to help you avoid the same ones. Learn in multiple ways – Learning styles are visual, auditory (hearing), kinesthetic (hands-on), a combination. Instead of just listening to a podcast, rehearse the new information visually and verbally. The more regions of the brain that store data about a subject, the more interconnection there is in the brain. God gave us a brain and He wants us to use it, to learn, to grow, to be all He created us to be! Write your thoughts down with pen and paper, on your computer, or record them on your smart phone. Jot down or record those ideas that come in the middle of the night or the first thing in the morning, that you don’t want to forget. Make to-do lists with pen and paper, getting quiet before God and letting Him schedule your day. Prioritize and schedule your life. Clean and organize your surroundings -your home, your desk, your car. When your environment is chaotic, you will feel that way inside. Your mind will be cluttered when your desk is. File important papers, organize folders, have tubs, baskets, or boxes for writing utensils, cords and charges, sticky notes. Get rid of the debris and clutter to make room for more creative ideas to flow and creative work to be accomplished. Eat or take Smart Fats (Omega 3’s) in capsule form (the purest form, and that are free of mercury). Omega 3’s improve memory, calm ADHD and hyperactivity, and can even help you lose weight. Exercise. Exercise can help memory and learning. Women ages 60 to 75, who walked briskly for an hour a day, showed a 25% higher scores in cognitive ability than women who just stretched and didn’t push their limits. (Resource: www.howtolearn.com/start/52-instant-learning-tips) If we want to be in better health and learn more and faster by the time we are that age, then we need to start taking care of ourselves now with healthy eating, learning new things, and exercise! The dentate gyrus is a region of the brain critical for retaining long term memory for facts and events. Exercise can target the dentate gyrus. (Resource: http://thechart.blogs.cnn.com/2010/04/12/studying-the-link-between-exercise-and-learning/) Get that body movin’, baby! Do something you’ve never done before. Go horseback riding, take swimming lessons, ride a hot air balloon, take a foreign language class, enroll in a college course, try parasailiing (just once for me, thank you very much!) or parachuting, take a trip overseas. Get out of your comfort zone. Meeting new people, trying new ethnic foods, visiting a new place will expand your horizons and will enhance your learning. Do these things, even if you feel afraid. It will be liberating. What new thing have you learned today? Keep learning and growing!